One of several (currently) delightful Water Jugs from Burleigh Ware, each with an embossed decoration around the Jug and each with a stylish handle featuring some form of animal. On his occasion, it is a Rabbit at Harvest Time painted with yellow and brown hues of both Rabbit and wheatsheaves. There is a spotted black rim along the top edge all set on a variable green and yellow interior ground. The Jug is in excellent condition. This is 5.5 inches (14cms) tall. 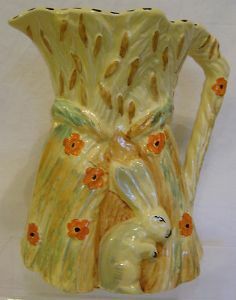 The backstamp has the Beehive pottery mark dating the Jug to the 1930s.